The 1981 movie musical Annie was the pinnacle of entertainment for this four, five, and six year old. 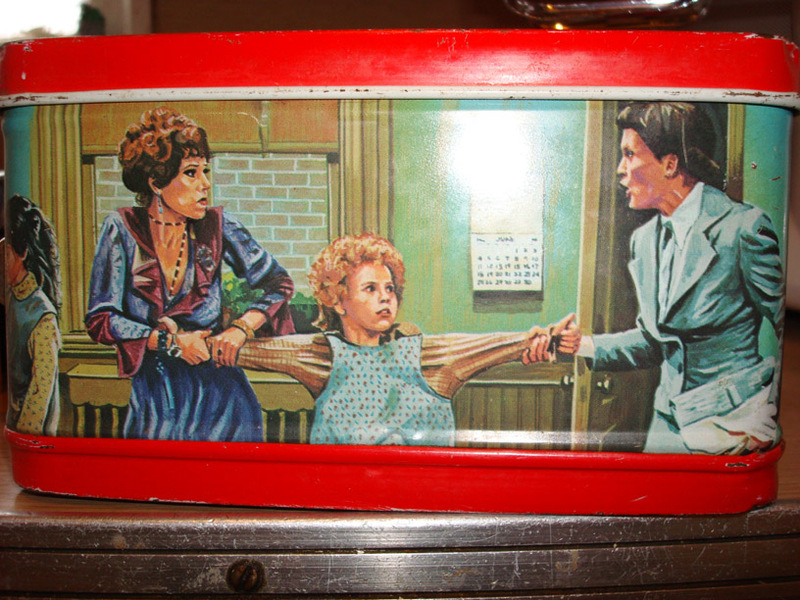 An image from my old Annie lunchbox has been returning to my mind a lot lately. This image, taken from a scene in the movie, is where Annie is literally being pulled apart by two opposing sides. This image keeps appearing in my head not because I feel like I’m in the company of Carol Burnett and Ann Reinking (but wouldn’t that be delightful? SIGH), but rather I often feel like I’m caught between two worlds, neither of which understand or fully appreciate each other. My fellow high-achieving peers from high school and college evacuated the state years ago for Harvard or CalTech. The peers that remain are usually preoccupied with buying homes and tending to their budding families. Even those I wish to see, I rarely do. Meanwhile, as I have had a social conscious for many years, I have come to align myself with various noble causes, which has led to fairly strong ties to Portland’s world-famous bicycling community. Many of these people live within a 20 minute bike ride of downtown Portland, while mine takes about an hour each way. How Does This Play Out? Say I’m invited to a party thrown by bikey people. It is generally expected that I will bike there, even if it’s several miles away, below freezing, will run late, and it’s the third night in a row I’m being expected to do it. Those who still find TriMet an acceptable method of transportation also don’t realize that transit doesn’t run very frequently in my area, stopping altogether at 11pm. On the other hand, say I’m invited to an event that is a couple of miles from my house, and I decide to bike. My mother regularly needles me, “I don’t know why you don’t just drive.” Frustrating, yes, but I’ve always been close with my family and unlike my bikey peers, my family regularly demonstrates that they care for me in a way almost nobody else does. In other words, I can’t win here. And believe me, I spent the better part of the last few years trying. In the Middle Other similar scenarios drive home the point that I am feeling caught between the life of a suburbanite and a Portland hipster. Here’s a newsflash though: I am neither of those things. After all, if you only see me as my mode of transportation, it’s obvious you’re not seeing me at all. As I’ve been pulling inward to regroup over the last few months, the challenge has been in starting to asserting myself in a gentle, yet clear way to all those who want to dictate how to live my life. Ever notice how neither Mrs. Hannigan nor Miss Farrell asked little Annie what she wanted in that arm-pulling scene? Like you, I’ve never seemed to seamlessly fit in any situation. I’m always the *only one* who is from somewhere else, or doesn’t go to that church, or isn’t married, or SOMETHING.